In the documents for Environmental Impact Assessment (EIA) of an incinerator, the ČEZ Group says that the total emissions of toxic dioxins into the air are 25-times higher than the ones published by the Ministry of Environment. From the ČEZ documents, it further states that the majority of the emissions are caused by natural processes, and it doesn't take into an account the dioxin burden in ash from incinerators. On the basis of these data, the company presents the conclusion that environmental impacts of incinerators are completely negligible. Thus, ČEZ publicly uses and presents false data in order to favour the construction of an incinerator near the city of Mělník. For illustration, the ČEZ's misleading number of 740 g TEQ represents an annual limit dose for 14.5 billion people, if they consumed the dioxins in foodstuffs[iv]. After conversion of the dioxin amounts to their weight per an inhabitant, and comparison with the numbers reported by countries from all over the world, the situation in the Czech Republic would be, according to ČEZ, a little bit worse than in Kenya, 4-times worse than in Kazakhstan, Ukraine or Argentina, 6-times worse than in Russia, 20-times worse than China or the United Kingdom, and 30-times worse than in India. 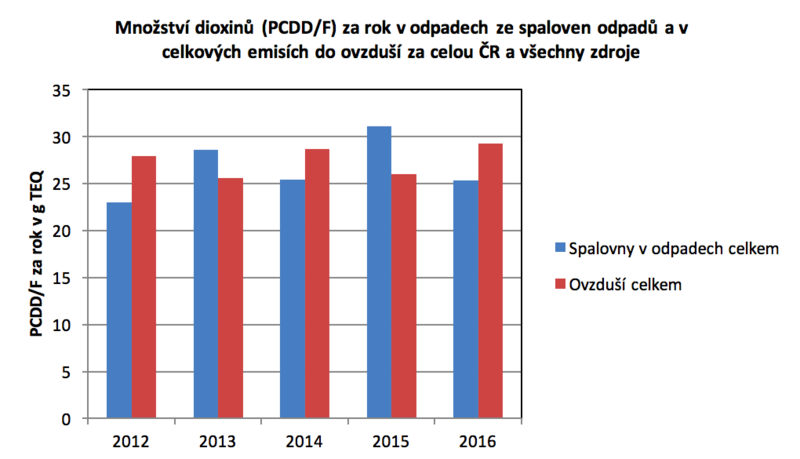 ČEZ further says that 82.5 % of dioxin emissions are produced by natural processes, for example during forest fires. „In fact, majority of dioxins are produced as a consequence of human activities, in chemical industry and by burning chlorinated substances. The international panel of experts calculated that the forest fire share of dioxin emissions is very small. If all the forests in the Czech Republic were destroyed by fire, dioxin emissions would reach, on the basis of the expert data, about three fifths of 740 g TEQ,“ commented Petrlík a further disgrace in the ČEZ documents that should serve as a basis for approving a big waste incinerator in the vicinity of Mělník. Moreover, the energy company informs only on dioxin emissions into the air, to which the incinerators contribute by less than 0.5 % in the Czech Republic. It intentionally omits fly ash and ash. In them, incinerators produce as high amounts of dioxins as the emissions of these substances into the air in the whole country. „Naturally, the further fate of dioxins in fly ash is also important. Many times already, it was confirmed that fly ash from incinerators was used during various reclamation works, or as a construction material. In such a case, they get out of control, and may often spread into the surrounding environment, and contaminate it,. However, ČEZ does not solve much the problem of management of fly ash from the planned incinerator either,“ added Petrlík. „ČEZ tries to sugar-coat its plan, but yet, it does not even know exactly what technologies of waste incineration and flue gas treatment it will use. Many people in municipalities in the surroundings of the power plant are annoyed, and for sure, misrepresentation of information will not help ČEZ, rather the reverse will be true,“ thinks PhDr. Hana Beranová from the association Ekozahrada pod věží (Ecogarden below the Tower) from Horní Počaply where the incinerator construction is planned. Arnika and the association from Horní Počaply have asked the Minister of Environment, in an open letter, to return the environmental impact assessment, based, among other things, on completely misrepresented information provided by ČEZ and the author of the EIA documents, because of its faultiness. Simultaneously, they have asked the Minister to supervise that true information is given to the public on emissions and other data concerning persistent organic pollutants. „We do not want anything more than compliance with the Stockholm Convention, ratified by the Czech Republic. According to it, the public has the right to have access to up-to-date information, and, simultaneously, the right to participate in solving the issues concerning substances such as dioxins and their health and environmental impacts,“ concluded Petrlík. Waste incinerators tend to be big industrial producers of dioxins, some of which are highly carcinogenic, reprotoxic, and damage the nervous and immune systems. Arnika has monitored the environmental impacts of incinerators in the long term, and has published information on dioxin amounts in waste and emissions at the web page www.znecistovatele.cz. [i] The official name of the construction used by ČEZ is Závod na energetické využití odpadu (ZEVO; Plant for Waste Energy Recovery) Mělník. In fact, it is a waste incinerator using steam for water heating and heating of buildings, and equipped with a turbine for electricity production. [ii] TEQ – dioxins show various levels of toxicity. Because of that, the so-called toxic equivalent is used when stating their amounts. It expresses the toxicity level of a specific type of dioxin in relation to the most toxic one of them (2,3,7,8 tetrachlorodibenzo-p-dioxin, TCDD). [iii] PCDD/Fs - polychlorinated dibenzo-p-dioxins and dibenzofurans, abbreviated as dioxins. iv] The recommended maximum intake of dioxins (mostly in foodstuffs) is 2 pg TEQ/kg of body weight daily, it means 140 pg TEQ daily for a person having the weight of 70 kg.